The last one of my new Educational Insights games that I will be reviewing is "Pancake Pile-Up," a fun movement game that is also great for working on sequencing skills. 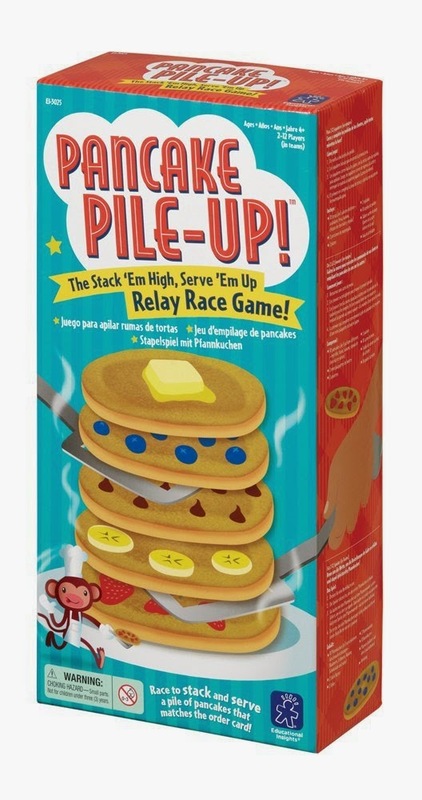 The object of this game is to replicate stacks of different-flavored pancakes shown on a card by putting the pancake on a spatula and racing it from the imaginary griddle to the plate. Whoever can do so the fastest without making a mistake is declared the winner (or the server who will earn the greatest tip). Go from this... ...to this! The game starts by an order card being turned over - servers need to replicate the pattern by finding and stacking matching pancakes. They take turns racing the correct pancake from the griddle to the customer's table. The race concludes when a team manages to complete the pancake and places the butter patty on top. The other team will check to ensure no errors were made. I am aware that many of us SLPs lack the space to do an activity that spans over any distance because our speech rooms are often the size of broom closets -- you can easily modify this game by just doing it all in one spot. The way we did it was simply by placing the plate next to the griddle. When a student was done with their turn, the next student had to figure out which pancake would have to be next in the line-up. This worked really well and my 3rd grade SDC students still had fun! If you do have the space, this game is especially great for very active students who respond well to gross motor activities. Students really have to pay attention to what the other members on your team are doing and be vigilant in regards to which step they are on. This game lends a wonderful opportunity for working on sequencing skills as well! The pancake fell off the stack. We also practiced some basic social skills / problem-solving: if the pancake falls off the spatula, should you use your hands to pick it up and spread your germs on it? Or should you get a new pancake? What might happen if you touch someone else's food? Would you want to eat food that has fallen onto the ground or was touched by someone else's germy hands? Why not? etc. 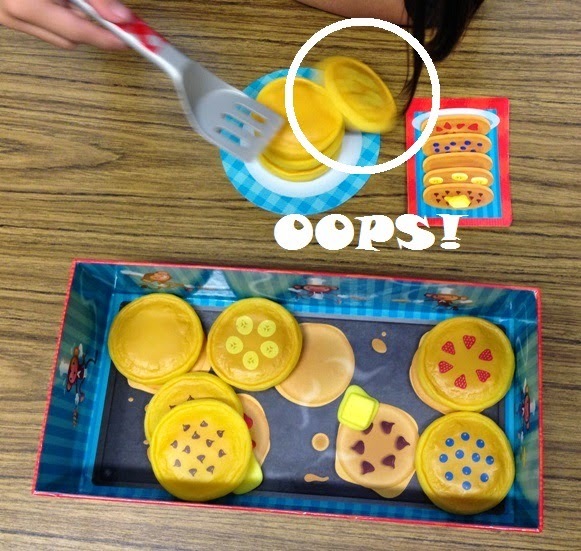 Sequencing: You can work on sequential vocabulary with this game -- "First we put the blueberry pancake on the plate. Which pancake is next?" 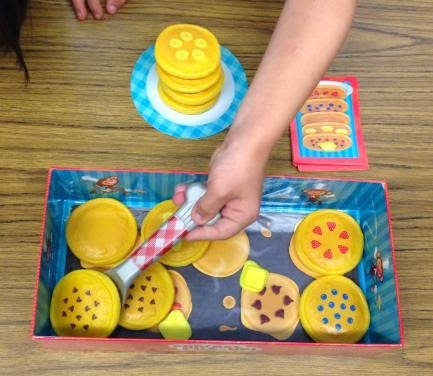 Pretend Play: You can simply use the pancakes, plates, and spatula in play therapy! The pancakes and spatula are very durable and should hold up well. Counting: You can have students count how many strawberries / blueberries / chocolate chips are on each pancake or how many pancakes are in your stack. Social Skills / Teamwork: The relay race creates a wonderful opportunity for teamwork, as well as good sportsmanship. Vocabulary: This game is great for working on vocabulary terms such as stack, spatula, griddle, plain, flavor, etc. Basic Concepts: You can also work on basic concepts - "The banana pancake is between the plain pancake and the strawberry pancake." Memory: Memory skills are exercised as students have to remember which step they are on. Motor skills: Students will get a great exercise in balance and coordination in this game. It became especially challenging to balance the pancakes as stacks got taller! I will definitely be using this game for my social skills group for team-building! This is another great speech room addition!